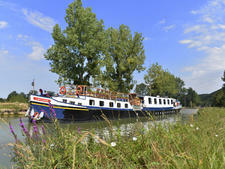 British-based European Waterways has offered luxury hotel barging on Europe's rivers and canals for more than 30 years. A barge is a flat-bottomed vessel built to navigate rivers and inland waterways, and many of the vessels owned and operated by the company began life as Dutch transportation boats. 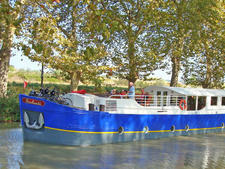 They have been renovated and refurbished as floating hotels to offer a comfortable and gracious way of getting up close and personal with the European countryside. The company operates 17 barges. The whole fleet provides fine cuisine -- most often regional specialties are included -- and complimentary good wines and liquors. All meals, drinks and excursions are included in the price of the trip. Passengers can choose to do as little or as much as they want as the barge glides along shaded waterways offering picture-book vistas of regal castles, tiny villages and ageless forests. Expect fine wood paneling, soft carpeting and a mix of antique and traditional decor. The barges offer a country inn feel and that same relaxed attitude from stem to stern. Think of them as charming country inns on the water and you've got the concept. All cabins have central heating and most have air-conditioning; all have en suite shower or bathroom, and range from twin or double-bedded staterooms to suites with sitting areas. Cabins are not large, so expect compact and comfortable. Barges sail at a slow pace; often going through half a dozen or more locks in a week's time, and since the pace is slow, life aboard the vessel is quiet. Interesting excursions are optional and most are included with the cruise fare. Don't expect large production shows in a mega-theater, or even a television for that matter, but each barge has a library, some have a hot tub, and all have a CD/stereo in the saloon. Each winter the fleet is overhauled and updated, many of the barges traveling hundreds of miles to shipyards in Belgium or Holland. BBarge passengers are a well-educated, well-traveled lot, primarily 50-plus, who like getting away from it all in a beautiful and serene setting. Most of the barge passengers are from North America and the U.K., but Go Barging markets internationally and representation on board from Europe and other parts of the world has been growing. Although there are no concessions for children on regularly scheduled trips, all the boats offer themed family charters where children are well accommodated with cribs, high-chairs, toys and games. Barges accommodate from six to 20 passengers. Each barge has its own particular flavour. 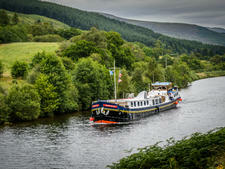 Scottish Highlander, for example, offers Tartan furnishings and sails the waterways around Loch Ness. Covering other areas of the United Kingdom is the eight-passenger Magna Carta, which cruises along the Thames. You can also find cruises throughout Holland and Belgium on the 12-passenger Panache and Savoir Faire and the 8-passenger La Nouvelle Etoile. The 10-passenger Shannon Princess plies the waters of Ireland's River Shannon and the 20 passenger La Bella Vita cruises in Italy from Venice to Mantua. In France, there are the 12-passenger La Belle Epoque and L'Impressionniste, sailing through Burgundy and the South of France, respectively. 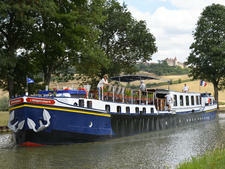 The 8 passenger L'Art de Vivre, which cruises the canals of Burgundy; The 8 passenger Anjodi and Enchanté, the 10 passenger Athos and the 6 passenger Clair de Lune on the Canal du midi; The 6 passenger Nymphea in France's Loire Valley and again, the 12 passenger Panache in Alsace-Lorraine. Most crew members are English, Scottish or Irish; each crew member is fluent in English and at least one other language, often the language of the host country. In addition to cooking, cleaning and working the locks, crew members offer charming narrations on the countryside as the vessels move from place to place. They also explain regional cuisine, wines, cheese selections, history and outstanding natural beauty to passengers. Most barges carry bicycles onboard. Barges sail along the Caledonian Canal and Loch Ness, Scotland's Great Glen, through Burgundy, Bordeaux and Provence in France, the Venice Lagoon, along the river Shannon in Ireland and the river Thames in England. 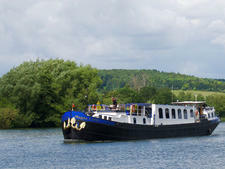 European Waterways has been cruising in England, Ireland, Scotland, Germany, France and Italy since 1974. Current itineraries also include Holland and Belgium.